Control color, size, shape, detail, text, and tooltips for marks in the view using the Marks card. Drag fields to buttons on the Marks card to encode the mark data. Click the buttons on the Marks card to open Mark properties. For related information on marks, see Change the Type of Mark in the View and Marks card. On the Marks card, click Color, and then select a color from the menu. This updates all marks in the view to the color you choose. All marks have a default color, even when there are no fields on Color on the Marks card. For most marks, blue is the default color; for text, black is the default color. From the Data pane, drag a field to Color on the Marks card. 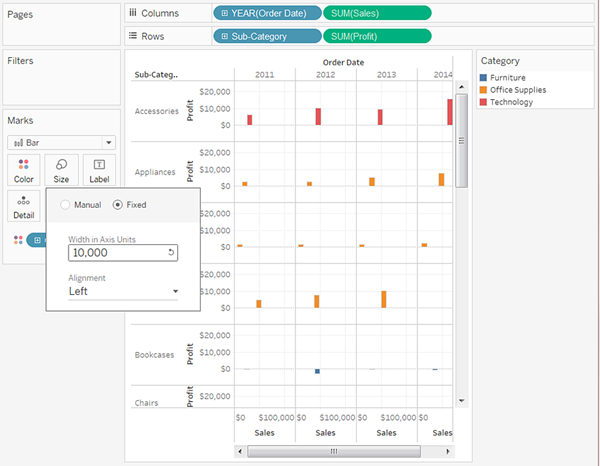 Tableau applies different colors to marks based on the field’s values and members. For example, if you drop a discrete field (a blue field), such as Category, on Color, the marks in the view are broken out by category, and each category is assigned a color. If you drop a continuous field, such as SUM(sales), on Color, each mark in the view is colored based on its sales value. On the Marks card, click Color > Edit Colors. For more information, see Color Palettes and Effects. On the Marks card, click Size, and then move the slider to the left or right. The Size slider affects different marks in different ways, as described in the following table. Circle, Square, Shape, Text Makes the mark bigger or smaller. Bar, Gantt Bar Makes bars wider or narrower. Line Makes lines thicker or thinner. Polygon You cannot change the size of a polygon. Pie Makes the overall size of the pie bigger and smaller. The size of your data view is not modified when you change marks using the Size slider. However, if you change the view size, the mark size might change to accommodate the new formatting. For example, if you make the table bigger, the marks might become bigger as well. From the Data pane, drag a field to Size on the Marks card. When you place a discrete field on Size on the Marks card, Tableau separates the marks according to the members in the dimension, and assigns a unique size to each member. Because size has an inherent order (small to big), categorical sizes work best for ordered data like years or quarters. Size-encoding data with a discrete field separates the marks in the same way as the Detail property does, and then provides additional information (a size) for each mark. For more information, see Separate marks in the view by dimension members . 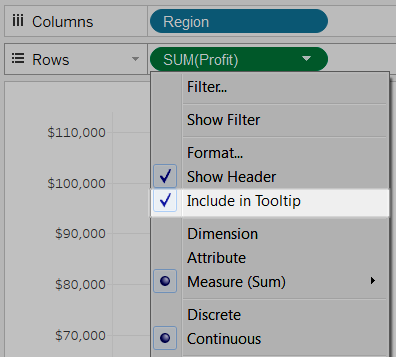 When you add categorical size encoding to a view, Tableau displays a legend showing the sizes assigned to each member in the field on the Size target. You can modify how these sizes are distributed using the Edit Sizes dialog box. When you place a continuous field on Size on the Marks card, Tableau draws each mark with a different size using a continuous range. The smallest value is assigned the smallest sized mark and the largest value is represented by the largest mark. When you add quantitative size encoding to the view, Tableau displays a legend showing the range of values over which sizes are assigned. You can modify how these sizes are distributed using the Edit Sizes dialog box. On the Size legend card (which appears when you add a field to Size on the Marks card), click the drop-down arrow in the right-hand corner and select Edit Sizes. For more information about legends, see Legends. In the Edit Sizes dialog box that appears, make your changes and then click OK. The options available depend on whether the field being applied to Size is a continuous or discrete field. 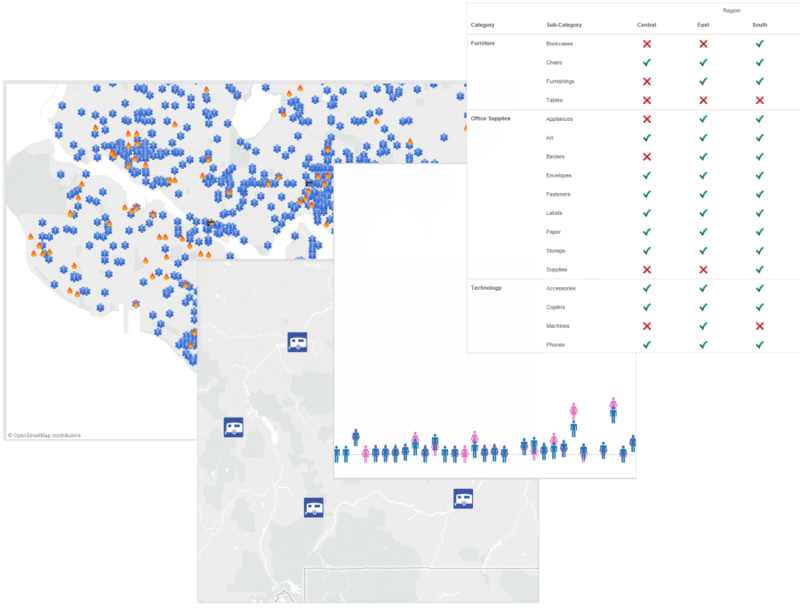 Automatically - Selects the mapping that best fits your data. If the data is numeric and does not cross zero (all positive or all negative), the From zero mapping is used. Otherwise, the By range mapping is used. By range - Uses the minimum and maximum values in the data to determine the distribution of sizes. For example, if a field has values from 14 to 25, the sizes are distributed across this range. From zero - Sizes are interpolated from zero, assigning the maximum mark size to the absolute value of the data value that is farthest from zero. Use the range slider to adjust the distribution of sizes. When the From zero mapping is selected from the Sizes vary drop-down menu, the lower slider is disabled because it is always set to zero. Select Reversed to assign the largest mark to the smallest value and the smallest mark to the largest value. 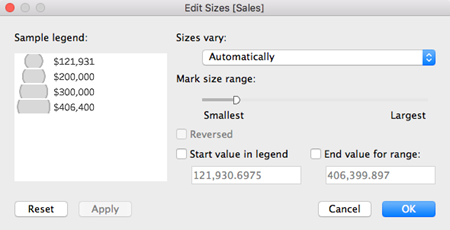 This option is not available if you are mapping sizes from zero because the smallest mark is always assigned to zero. To modify the distribution of sizes, select the Start value in legend and End value for range check boxes and type beginning and end values for the range. Use the range slider to adjust the distribution of sizes. Select Reversed to assign the largest mark to the smallest value and the smallest mark to the largest value. When there is a continuous date field on the axis where the bars are anchored, the width of the marks is set to match the level of the date field. For example, if the level of the continuous date field is MONTH, the bars are exactly one month wide—that is, slightly wider for 31-day months than for 30-day months. You can configure the width of the bars by clicking the Size card, choosing Fixed, and then typing a number in the Width in days field, but the resulting bar widths don't take into account the varying lengths of time units such as months and years. From the Data pane, drag a field to Label or Text on the Marks card. When working with a text table, the Label shelf is replaced with Text, which allows you to view the numbers associated with a data view. The effect of text-encoding your data view depends on whether you use a dimension or a measure. Dimension – When you place a dimension on Label or Text on the Marks card, Tableau separates the marks according to the members in the dimension. The text labels are driven by the dimension member names. Measure – When you place a measure on Label or Text on the Marks card, the text labels are driven by the measure values. The measure can be either aggregated or disaggregated. However, dis-aggregating the measure is generally not useful because it often results in overlapping text. Text is the default mark type for a text table, which is also referred to as a cross-tab or a PivotTable. From the Data pane, drag a dimension to Detail on the Marks card. When you drop a dimension on Detail on the Marks card, the marks in a data view are separated according to the members of that dimension. Unlike dropping a dimension on the Rows or Columns shelf, dropping it on Detail on the Marks card is a way to show more data without changing the table structure. Tooltips are details that appear when you hover over one or more marks in the view. 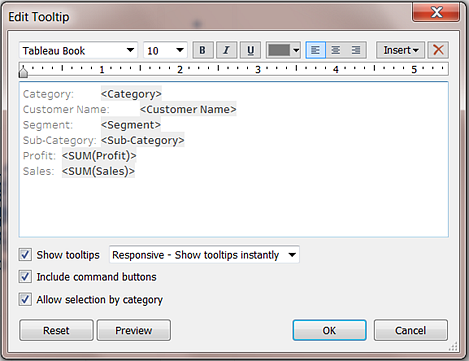 Tooltips are also convenient for quickly filtering or removing a selection, or viewing underlying data. You can edit a tooltip to include both static and dynamic text. You can also modify which fields are included in a tooltip and whether you want to be able to use those fields to select marks in the view. For details on showing a visualization from a worksheet in a tooltip (Viz in Tooltip), Create Views in Tooltips (Viz in Tooltip). Drag a field to Tooltip on the Marks card. Click Tooltip on the Marks card to open the Edit Tooltip dialog box, where you can add text, rearrange the tooltip contents, and insert more fields. Note: Dimensions are added to the tooltip using the ATTR aggregation, which means the tooltip may sometimes display as an asterisk. The asterisk indicates that there are multiple dimension members that apply to the mark you are pointing at. For example, a mark may represent the aggregated sales for all regions. Adding the Region field to the tooltip results in an asterisk because the mark represents more than one region. To avoid showing an asterisk, add the dimension to Detail on the Marks card or use it elsewhere in the view to ensure the marks are at the same level of detail. After you open the Edit Tooltip dialog box, there are several options that you can choose from to format the tooltips in your view and configure their behavior. You can choose from the options below. Format tooltips: Tooltips are specified on a per-sheet basis and can be formatted using the tools on the top of the Edit Tooltip dialog box. Adding dynamic text: Use the Insert menu at the top of the dialog box to add dynamic text such as field values, sheet properties, and more. The All Fields command on the Insert menu adds all field names and values that are used in the view to the tooltip for any mark in the view. Show tooltips: Tooltips are shown by default. If you prefer to hide automatic tooltips, clear the Show Tooltips check box. Responsive - Show tooltips instantly: Select this option to show tooltips instantly as you move the cursor over the marks in the view. This is the default for all views. With this option, tooltips appear without command buttons. You must first click a mark in the view to see the command buttons. On Hover - Show tooltips on hover: Select this option to show tooltips only after you rest the cursor on a mark. However, with this option, command buttons appear on the tooltip without any further action from you (unless you specify otherwise in the Edit Tooltips dialog box). Show commands: Select the Include command buttons check box to add Keep Only, Exclude, Group Members, Create Set and View Data buttons at the top of the tooltip. 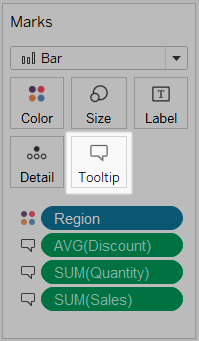 These buttons show both in Tableau Desktop and when the view is published to the web or viewed on a mobile device. For more information about grouping members, see Correct Data Errors or Combine Dimension Members by Grouping Your Data. For more information about creating sets, see Create Sets. Select marks in a view from the tooltip. Select the Allow selection by category check box to be able to select marks in a view that have the same value by clicking on a discrete field in a tooltip. If this check box is selected, you can use this feature to select marks in a view in Tableau Desktop, when the view is published to the web or viewed on a mobile device. Add or remove fields: To add and remove fields when using the automatic tooltip, right-click (control-click on Mac) the field on one of the shelves in the view and select Include in Tooltip. Note: The Include in Tooltip option is only available if you have not customized the tooltip. If you have customized the tooltip, you can return to the automatic tooltip by clicking Tooltip on the Marks card and then clicking Reset in the Edit Tooltip dialog box. From the Data pane, drag a field to Shape on the Marks card. When you place a dimension on Shape on the Marks card, Tableau separates the marks according to the members in the dimension, and assigns a unique shape to each member. Tableau also displays a shape legend, which shows each member name and its associated shape. When you place a measure on Shape on the Marks card, the measure is converted to a discrete measure. Shape-encoding data separates the marks in the same way as the Detail property does, and then provides additional information (a shape) for each mark. 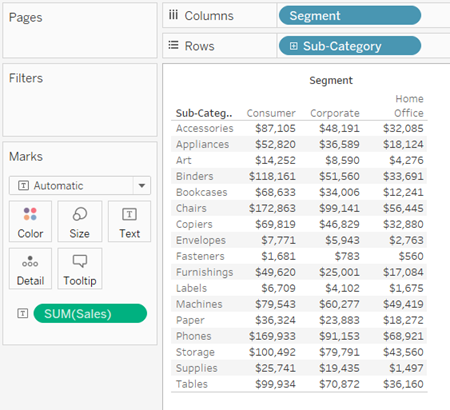 Shape is the default mark type when measures are the inner most fields for both the Rows shelf and the Columns shelf. In the view below, the marks are separated into different shapes according to the members of the Customer Segment dimension. Each shape reflects the customer segment’s contribution to profit and sales. By default, ten unique shapes are used to encode dimensions. If you have more than 10 members, the shapes repeat. 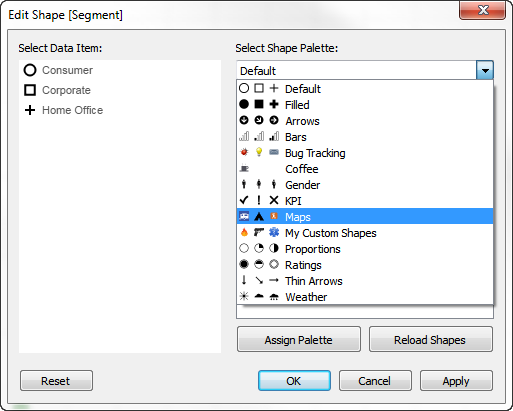 In addition to the default palette, you can choose from a variety of shape palettes, including filled shapes, arrows, and even weather symbols. Click Shape on the Marks card, or select Edit Shape on the legend’s card menu. 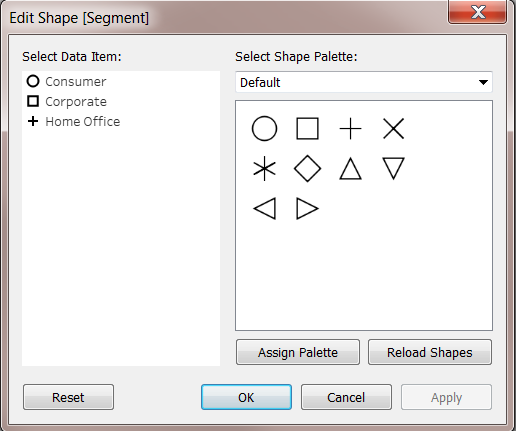 In the Edit Shape dialog box, select a member on the left and then select the new shape in the palette on the right. You can also click Assign Palette to quickly assign the shapes to the members of the field. Select a different shape palette using the drop-down menu in the upper right. Note: Shape encodings are shared across multiple worksheets that use the same data source. For example, if you define Furniture products to be represented by a square, they will automatically be squares in all other views in the workbook. To set the default shape encodings for a field, right-click (control-click on Mac) the field in the Data pane and select Default Properties > Shape. 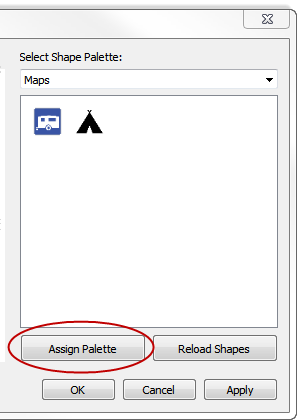 You can add custom shapes to a workbook by copying shape image files to the Shapes folder in your Tableau Repository, which is located in your Documents folder. When you use custom shapes, they are saved with the workbook. That way the workbook can be shared with others. Create your shape image files. Each shape should be saved as its own file and can be in any of several image formats including bitmap (.bmp), portable network graphic (.png), .jpg, and graphics interchange format (.gif). 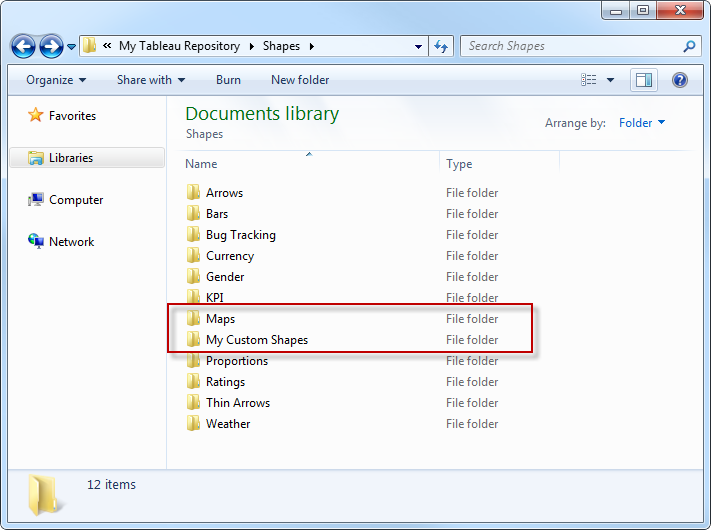 Copy the shape files to a new folder in the My Tableau Repository\Shapes folder in your Documents folder. The name of the folder will be used as the name of the palette in Tableau. In the example below, two new palettes are created: Maps and My Custom Shapes. 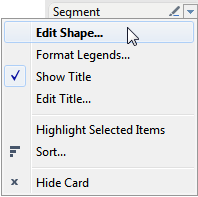 In Tableau, click the drop-down arrow on the shape legend, and select Edit Shape. Select the new custom palette in the drop-down list. 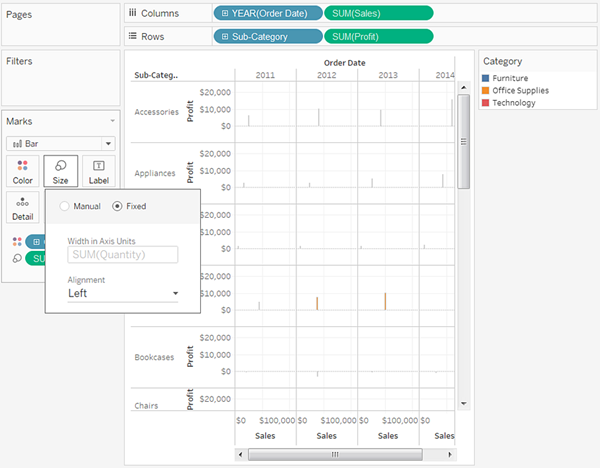 If you modified the shapes while Tableau was running, you may need to click Reload Shapes. You can either assign members shapes one at a time, or click Assign Palette to automatically assign the shapes to the members. Note: You can return to the default palette by clicking the Reset button. If you open a workbook that uses custom shapes that you don’t have, the workbook will show the custom shapes because the shapes are saved as part of the workbook. However, you can click Reload Shapes in the Edit Shapes dialog box to use the ones in your repository instead. Below are some examples of views that use both the default and custom shape palettes. When you create custom shapes there are a few things that you can do to improve how your shapes look and function in the view. If you are creating your own shapes, we recommend following general guidelines for making icons or clip art. Suggested size - Unless you plan on using Size to make the shapes really large, you should try to make your original shape size close to 32 pixels by 32 pixels. 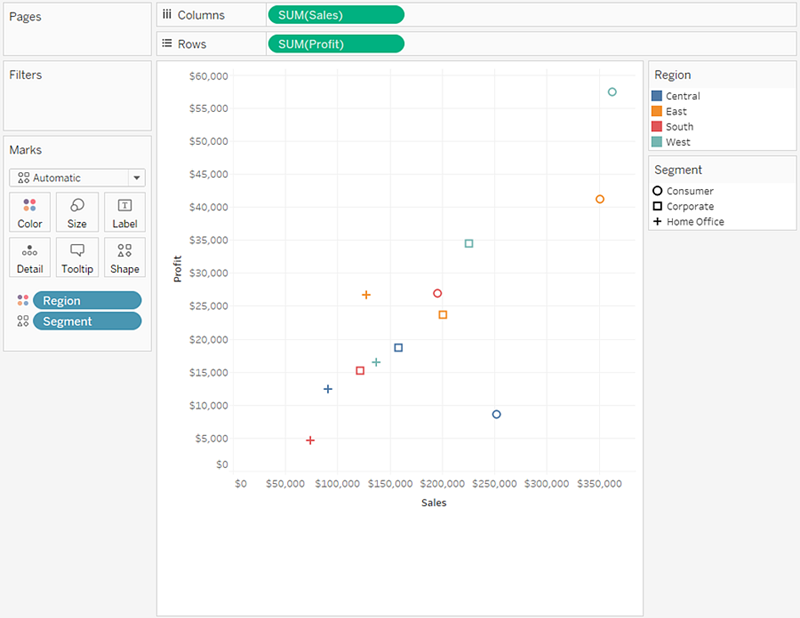 However, the original size depends on the range of sizes you want available in Tableau. 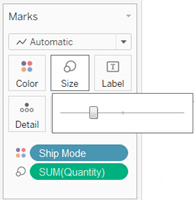 You can resize the shapes in Tableau by clicking Size on the Marks card, or by using the cell size options on the Format menu. Note: Avoid including too much transparency around an image. Make the size of the custom shape as close to the size of the image as possible. Extra transparent pixels around the edges of the image can negatively effect the hover or click behavior near the image, especially when custom shapes overlap each other. When the actual shape area is bigger than what is visible, it can make hovering and clicking the shape more difficult and less predictable for users. File formats - Tableau doesn't support symbols that are in the Enhanced Meta File format (.emf). The shape image files can be in one of the following formats: .png, .gif, .jpg, .bmp, and .tiff. The Path property is available when the Line or Polygon mark type is selected in the Marks card drop-down menu. For more information about how to change the type of mark displayed in your viz, see Change the Type of Mark in the View. You can use the Path property in the Marks card to change the type of line mark (linear, step, or jump), or to encode data by connecting marks using a particular drawing order. You can path-encode your data using either a dimension or a measure. Dimension – When you place a dimension on Path on the Marks card, Tableau connects the marks according to the members in the dimension. If the dimension is a date, the drawing order is driven by the date order. If the dimension includes words such as customer names or product types, the drawing order is driven by the order of the members in the data source. You can change the order that data points are connected by changing the sort order of the members. For more information, see Sort Data in a Visualization. 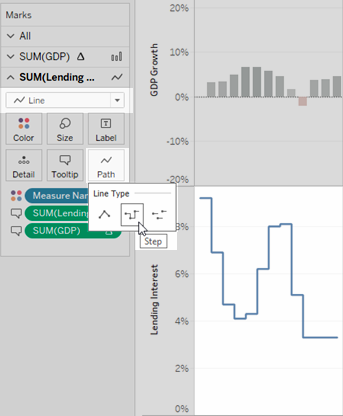 Measure – When you place a measure on Path on the Marks card, Tableau connects the marks according to the values of the measure. The measure can be aggregated or disaggregated. When the mark type is set to be a line (Automatic or Line), you can click the Path property in the Marks card to change the line type. Use these line types for numeric data that remains constant for periods of time, with noticeable changes or deltas – such as account balances, inventory levels, or interest rates. Step lines work well for emphasizing the magnitude of change. Jump lines help to emphasize the duration of change between data points. Click Path in the Marks card. Select Linear, Step, or Jump to change the line type. To create a useful path-encoded view, your data table should contain at least one measure. You can't create a path that connects only categorical data (dimensions). The view below was created using storm data from the Atlantic basin in 2010. The view uses line marks with the path determined by the date of the storm. This lets you see the path of the storm. By placing the continuous date on Path on the Marks card, this tells Tableau to draw the lines in chronological order. 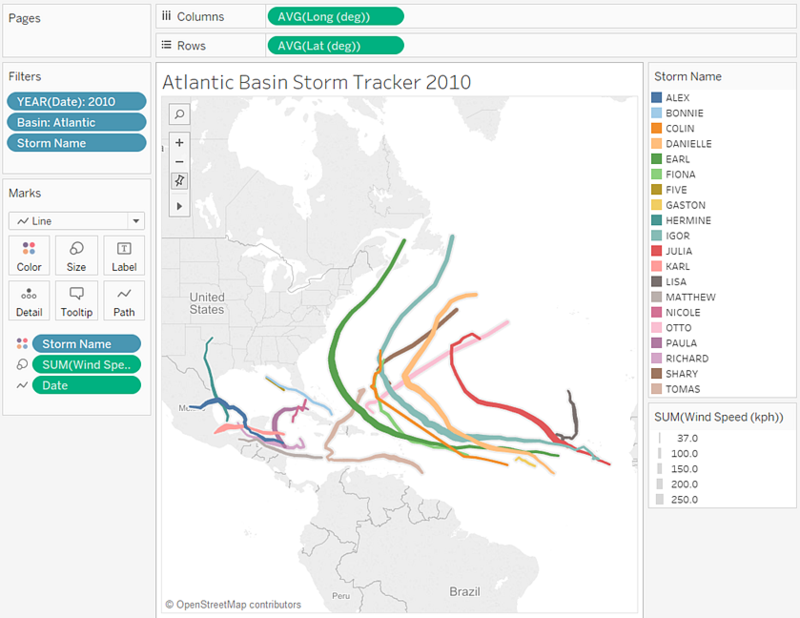 For more information, see Create Maps that Show a Path Over Time in Tableau and Create Maps that Show Paths Between Origins and Destinations in Tableau .